You’re an idiot!!! We have to ratify that amendment. Guns kill people, bottom line. A gun is resting in my nightstand, the gun hasn’t killed anyone yet. If you don’t value your civil rights be it right to not be searched without a warrant, or freely express your views. Then don’t bother people who do value their civil rights. Stop trying to take away people’s civil rights. You’d be a bootlicker if you were living under a dictatorship. And spoons make people fat. Cars make people drive drunk. Also if you result to name calling it just means your argument is weak. You’re sooo on it! Just the other day I saw 3 guns escape from the gun store and assemble themselves into a much bigger, meaner gun that ran around town terminator style killing anyone named Sarah Connor! Guns kill people, bottom line! I think I hear some right now trying to shoot thru the pads of the cell next to mine! Holy crap, the 6 guns I have at my house have killed people? Oh wait, they haven’t because they are in a safe, but I bet if I laid it on the counter it would get up and start murdering people on its own right? Guns are tools, they require a user. F, you get an “F” for ability to be reasonable. Very well written article, with sources. I’ll go hug my guns now. Though, I did leave them alone all day. Lmfao i love it when an idiotis so blind they call a person of sound mind an idiot. Guns don’t kill people, people kill people bottom line. The 2nd amendment was put in place to protect us from a tyrannical government because our founding fathers got to see tyranny first and vowed that we should never face that again. But you know the easiest way to rule a people is? Give them something to fear, take away their defences with promise to defend them yourself, and then rule over them since they can no longer defend themselves. Don’t you think it’s funny that they are lying about numbers and trying to say there is a mass shooting everyday? Don’t you think it’s funny that people who have had evidence to suggest dishonest play in the mass shootings we’ve seen, have simply disappeared? Don’t you think it’s funny that places with the strictest gun laws have the highest violent crimes and they continue to climb? Why is it that nobody knows that the guy who stopped the church shooting in Texas, did so with an AR-15? Why is it that dispite filly automatic weapons being illegal for a very long time now, so many gun grabbers think semi automatic is fully automatic and think this is what they are going after? Why do so many think the ar15 .223 carriage is such a large deadly round when in fact it’s actually not that lethal and inn many states is viewed as too small to use for hunting??? It’s all because of the lack of education and the fact that so many sheep follow blindly and believe everything they are told after a tragic event. “F”… The 2nd Amendment will NEVER be ratified…..Have a nice life…..
Technically LIBERALS with guns kill people in mass shootings. By your reasoning, if I wasn’t killed then I wasn’t shot. Your article talks about mass shooting not mass killings. Other than the CRS definition the other definitions talk about being shot not necessarily being killed. If you want to restrict occurrances to only those were 4 or more people, excluding the initial shooter, were killed that is fine but be clear tgat you are now talking about mass killings. I wonder why gun grabbers always have to inflate their statistics? Usually when you aren’t completely full of sh*t you don’t have to do anytjing like that. Nice article. 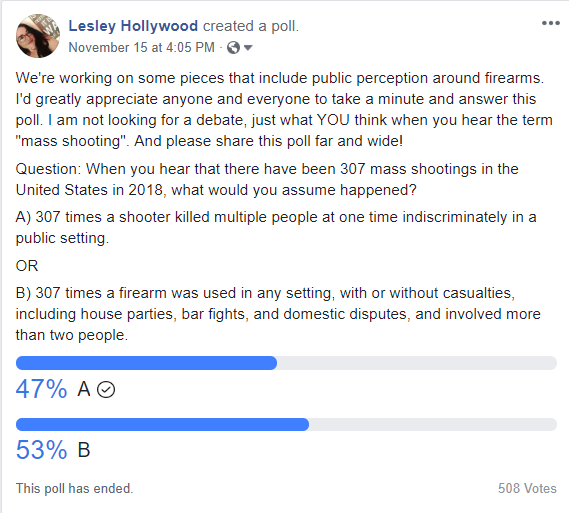 I realize this flies in the face of what the gun control crowd wants to believe but it’s nice to see that there’s no consensus on what defines a mass shooting. People are so diluded and opposed to any conversations that involve facts when it comes to guns. Thankfully we live in a republic where gun ownership is protected by the Constitution. Mother Jones list of mass shooting from 1982 to present. They use 3 or more killed. That makes 11 mas shootings this year. Yes, MJ is a Leftist media outlet, but sometimes they tell the truth. Gun bad orange man bad. Doctors kill more people every year than firearms owners. Should they be outlawed, too?